As we approach the thirty-fifth anniversary of Robert Temple’s The Sirius Mystery (1976; revised 1998), it has been fairly well-established that Temple’s thesis about extraterrestrial visitation has little basis in fact. Temple had claimed that an African tribe called the Dogon had sophisticated knowledge of the invisible companion to the star Sirius, known to modern astronomers as Sirius B, and that this knowledge derived from amphibious aliens that descended to earth in ancient Sumeria thousands of years ago and were worshipped as gods. Their possession of esoteric knowledge of deep space unknown in the West until the nineteenth century is taken as proof of extraterrestrial contact. Though anthropologists failed to find a genuine Sirius B tradition among the Dogon outside what they had gleaned from recent contact with Europeans , and skeptics refuted Temple’s extraterrestrial conclusions, The Sirius Mystery continues to serve as a standard reference work in the New Age and alternative archaeology movements. In the past few years alone, works such as Christopher Penczak’s Ascension Magick (Llewellyn Worldwide, 2007), R. M. Decker’s 35 Minutes to Mars (Galde Press, 2004), and Stephen S. Mehler’s The Land of Osiris (Adventures Unlimited, 2002) utilize Temple’s book to a greater or lesser extent to support their alternative and New Age claims. The internet, too, is a hotbed of Temple-derived Sirius theories. And, of course, Temple continues to publish books of alternative archaeology, including most recently The Sphinx Mystery (with Olivia Temple, Inner Traditions, 2009). Therefore, renewed study of The Sirius Mystery is no moot point but an inquiry into an active and important touchstone for the alternative movement. It is not my intention to review the case against Temple’s space-faring fish-men and their watery revelations. Such work has already been done, exhaustively, and, to most skeptics’ minds, conclusively . Instead, I would like to explore Robert Temple’s misuse of Greek mythology, specifically the myth of Jason and the Argonauts, to refute frequently repeated claims that, even if one doubts his most outrageous conclusions, Temple is “scholarly, careful, and scientifically honest” . Temple is frequently described as a “recognized scholar”  or even as a “preeminent scholar of mathematics, astronomy and mythology”  by proponents of alternative claims, and Temple himself cites his membership in the Royal Astronomical Society  and several classicist organizations to bolster Sirius’s claims to scholarship. An examination of the case of Temple v. Jason will demonstrate that claims for Temple’s Sirius scholarship are less solid than the case for the alleged aliens themselves. In Sirius, Temple makes a number of claims about Greek mythology in general and the story of Jason in particular, which he sees as a governing myth tying together all the threads of his Sirius mystery. Temple uses Jason’s legendary journey as a starting point for his forays into Greek, Egyptian, and Near Eastern mythology, and there is the strong impression that he views Jason’s quest for the Golden Fleece as parallel to his own search for the extraterrestrial secrets of the flying space frogs. For him, the Jason story is the one Greek myth most closely related to an esoteric tradition of alien-derived knowledge of the true nature of the binary Sirius star system—and he even views the Argonauts as the biological ancestors of the Dogon. In order to understand the scaffolding on which Temple builds his mythological claims, let us briefly review Jason’s story as it has come down to us. Jason was the son of Aeson, deposed king of Iolcus and rightful heir to the throne held by his usurping uncle Pelias. Pelias promised to restore the kingdom to Jason on condition that Jason bring the Golden Fleece from the kingdom of Colchis back to Iolcus, a quest Pelias is sure will end in Jason’s death. Jason therefore assembles fifty companions (originally unnamed but later associated with the greatest Greek heroes) on the ship Argo and sails to Colchis, experiencing many adventures. In Colchis, Jason fails to persuade its king to give him the fleece, and he instead steals it from the dragon that guards it with the help of the king’s daughter, the sorceress Medea, on condition that Jason marry her. Jason has many more adventures on the way back to Iolcus, where he presents the fleece and deposes his uncle. He then betrays Medea’s love, loses the favor of the gods, and dies when a piece of the dry-docked Argo falls on his head. The Jason story is cited elliptically in Homer (usually dated to c. 8th century BCE), briefly in Hesiod’s Theogony (c. 700 BCE), and is most fully developed in Pindar’s Fourth Pythian Ode (462 BCE) and Apollonius of Rhodes’s Argonautica (c. 245 BCE). Jason also appears in some early Greek and Etruscan art, but, intriguingly, some of these images show a different version of the legend, unrecorded in the surviving poems, in which Jason apparently descends into the dragon’s stomach and reemerges, aided by the goddess Athena rather than Medea . 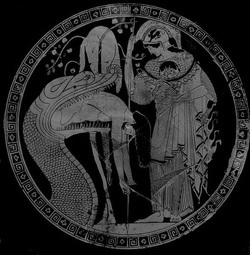 Informed scholarly conjecture is that the primal Jason legend dates to Mycenaean times (c. 1500 BCE) and originally featured a voyage to the end of the world (rather than specifically Colchis) to retrieve the fleece via a descent into the guardian dragon’s stomach and a triumph over death. It is possible Jason was dismembered and resurrected through Athena’s ministrations or his own supernatural healing powers . Medea may be a later addition to the original quest tale, though she must have appeared before 700 BCE, as she is in Hesiod. Such history is not considered in Sirius, despite at least two centuries of scholarly discussion about it. Jason emerges from the dragon, Douris cup. Jason and the fifty Argonauts represent Sirius A (the main star we see in the sky) and the fifty-year period it takes Sirius B (the hidden companion star) to travel around Sirius A. The Argo, their boat, is the system taken as a whole with its fifty oars representing each year of Sirius B’s orbit . In this, the Argonauts are therefore the equivalent of the Annunaki, the fifty anonymous gods of Sumer (remember the Argonauts were originally unnamed), who therefore are also symbols for Sirius B’s fifty-year orbit . Jason, whose name Temple believes means “appeaser,” is a feckless wimp  who usurped his position in a myth-cycle that originally centered on the epic voyage of Herakles (Hercules) , who in turn is a later remolding of a still-earlier mythological figure, Briareus, one of the hundred-handed, fifty-headed monsters who assaulted Olympus and were imprisoned in Tartarus. Therefore, Temple concludes, Briareus was the original captain of the Argo . Confusingly, and perhaps in partial contradiction, Jason is also identified as a version of the Sumerian hero Gilgamesh, primarily on the basis of both having fifty companions and many adventures . From this framework, Temple then branches out into increasingly fanciful excursions that are beyond the scope of this article. Since Temple’s defenders frequently cite his deep scholarship and thorough understanding of mythology and ancient history, it is only fair to ask how scholarly Temple’s mythological framework is. We can begin by dispensing with one point easily enough. The “feckless” Jason was the creation of Apollonius of Rhodes, who was writing in the Hellenistic period, five or six hundred years after the Homeric age of epic poetry, and a full millennium after the Jason tale may have originated in Mycenaean Greece. Apollonius purposely recast the hero as a vulnerable but brave human in keeping with the tastes and values of the era . Since this is a late development, it can have no bearing on the original myth or its supposed extraterrestrial antecedents. Similarly, I can find no support for Temple’s view that Jason’s name means “appeaser,” as nearly every scholarly source derives his name from the Greek word “to heal” . Temple provides no citation beyond his own assertion, and I am unable to determine his reasoning for his claim. These minor points safely dispensed with, we can move on to the meat of Temple’s Jason argument. Let us begin by asking on what grounds Temple identifies Jason as Herakles and Herakles as Briareus and/or Gilgamesh. Here, fortunately, Temple has made our job easy. In all these cases, the source of his identifications (and, indeed, it appears the entirety of his knowledge of Greek myth) is Robert Graves’s The Greek Myths (1955), which he explicitly cites. Graves identifies Jason and Herakles thus: “Jason and Herakles are, in fact, the same character so far as the marriage-task myth is concerned … Jason was, of course, a title of Herakles” . Here Graves argues that both stories reflect tasks associated with sacred kingship, and that Herakles at one point bore the title of a Jason (i.e., “healer,” a meaning Temple previously rejected). This is not exactly the same as saying that Herakles captained the Argo, and Temple appears to go farther than Graves on this point. Similarly thin is the ground uniting Herakles and Briareus. Graves holds that the Pillars of Herakles were once associated with Briareus and later assigned to Herakles after the Briareus myth “faded from memory,” though he does say (without evidence or explanation) that the earliest Herakles was named Briareus . Temple’s troubles are compounded when we discover that Graves identifies Herakles directly with Gilgamesh  without the need for Briareus or reference to the Argonauts. Worse, Graves specifically identifies Achilles as another Gilgamesh “variant,” and he cites the older myth of Jason’s descent into the dragon’s stomach (one Temple ignores) as related to the Bible’s tale of Jonah and the whale, Jonah being cited as synonymous with Marduk, the Babylonian god! As the reader may have guessed, Graves, who was a poet and novelist rather than an academic, had a particular and penchant for finding fanciful correspondences between mythological characters and for imposing his idiosyncratic views on the Greek myths. Immediately upon publication of The Greek Myths reviewers attacked Graves for his “defective scholarship”  for which there was “no conceivable evidence” to support his “inaccuracies, evasions, improbable analogies, and amateur etymologies” . In short, his scholarship was not to be trusted, and no reputable scholar would use Graves’s theories without copious documentary support, which is not to be found in The Sirius Mystery. However, Temple sees Graves as “invaluable” and “superb” . For Robert Temple to rely on Graves’s book not just as a convenient secondary reference for Greek myths but as the foundation for his understanding of mythology and the interrelationship of myths to one another is simply unsupportable. Even when Temple began writing Sirius in 1967, Graves’s missteps were well-known; by the time of the 1998 revision of Sirius, continued reliance on these erroneous interpretations was inexcusable. Other than a superficial swipe at Herakles’ and Orpheus’ appearance in Apollonius, Temple makes no attempt to separate late interpolations from older traditions, thus presenting every scrap of legend from 1500 BCE to 250 BCE as part of one unified Sirius-Jason complex, as though the myth were unchanged in its details for a thousand years. This would be the equivalent of trying to study early medieval Britain using only Tennyson’s Idylls of the King (1856-1885) and a rough idea that King Arthur lived in the Dark Ages. Obviously, one cannot claim on the basis of a modern retelling of a late version of a myth that an African tribe is the flesh-and-blood descendants of these mythic heroes. At this point, it should go without saying that any direct relationship between Jason’s fifty oarsmen and the “fifty” Anunnaki is entirely speculative. While the Anunnaki may occasionally be referred to as fifty in number (though Temple gives no source for this), their numbers vary in myth. The Babylonians, for example, considered them to be three hundred in number . However, to give the devil his due, Gilgamesh did have fifty companions in the earliest versions of his myth (c. 2000 BCE), though these were left out of the later versions of the first and second millenniums BCE, the versions current when the Jason myth was promulgated and eventually recorded. However, as half of one hundred, fifty was an exceedingly common number in mythology, and unless we choose to read all reference to fifty as Sirius lore, there needs to be something more than linguistic convenience to justify such an interpretation of a rather standard poetic number . I hope this review of Temple’s misuse ancient myth in The Sirius Mystery has accomplished two things: first, to demonstrate that an author who cannot be trusted in big things (the truth of extraterrestrial visitation) cannot be trusted in small things either; and second, to put to rest the persistent myth that even if one does not support Temple’s conclusions about intelligent space-faring frogmen that his scholarship and erudition are still an important contribution to the study of ancient mythology and history. There is a bit of poetic irony in all this, too. Robert Temple’s knowledge of Jason and the Argonauts, and the story’s history and development, seems to derive entirely from Robert Graves and his Greek Myths. Temple does not directly cite the Jason tales of Hesiod, Pindar, and Apollonius, the ancient authors from whom we derive our knowledge of the myth . Had he done so, he might just have noticed a curious passage in Apollonius, who describes Medea’s first glimpse of Jason at their clandestine meeting in Hecate’s temple: “[H]e appeared to her as she desired, like Sirius leaping high from Ocean…” . There you have it: Jason is Sirius! Of course, this is nothing but a bit of poetic simile, but its omission underscores just how poorly researched The Sirius Mystery really is, despite its hundreds of endnotes and reputation as the thinking person’s ancient astronaut book. Van Beek, W. E. A. 1991. “Dogon Restudied: A Field Evaluation of the Work of Marcel Griaule,” Current Anthropology 32, no. 2, pp. 139-167. See bibliography in The Skeptic’s Dictionary entry for the Dogon for a partial list of skeptical critiques and rebuttals (http://www.skepdic.com/dogon.html). Wilson, R. A. 1992. Right Where You Are Sitting Now: Further Tales of the Illuminati. Ronin Publishing, p. 78. Kennedy, J. 2004. Beyond the Rainbow: Renewing the Cosmic Connection. Buy Books,p. 149. Spenser, L. R. and South, C. L. 1999. The Oz Factors: The Wizard of Oz as an Analogy to the Mysteries of Life.Lulu, n.p. The RAS is “open to any person over the age of eighteen” with no formal qualifications or scholarly requirements and membership does not imply the organization’s official endorsement or support of its members’ views (see “How to Join” at http://www.ras.org.uk/). The same applies to the Society for the Promotion of Hellenic Studies, the Egypt Exploration Society, and the Royal Historical Society, all of which Temple listed as affiliations in the 1998 Sirius. Temple reproduces (reversed) one such image in the 1998 revision of Sirius and identifies the female figure with Medea, despite the obvious armor, aegis, and owl (not, as Temple claims, an oracular dove), Athena’s symbols. He also misidentifies Athena’s Medusa-head breastplate as a “serpent” and her armor as dragon scales. Temple confesses ignorance of the image’s meaning, implying that he neither recalled Graves’s interpretation of this image nor researched the scholarly literature, which had discussed the image since at least the nineteenth century. In another plate (again mirror reversed), he misidentifies a standard scene of Medea magically resurrecting a ram as an alchemical transmutation of a ram into gold and Pelias as Jason, demonstrating his lack of familiarity with the scholarly literature and Greek mythology in general. Sacks, D., Murray, O., and Bunson, M. 1997. A Dictionary of the Ancient Greek World.New York: Oxford University Press, p. 125; Mackie, C. J. 2001. “The Earliest Jason.” Greece and Rome 48, no. 1, pp. 1-17. In fact, Iolcus was a Mycenaean center with an extensive shipyard, which is perhaps why the Jason legend begins there. Temple, R. 1998. The Sirius Mystery: New Scientific Evidence of Alien Contact 5,000 Years Ago.Rochester, VT: Destiny Books, pp. 95-96. Jackson, S. 1992. “Apollonius’ Jason: Human Being in an Epic Scenario.” Greece & Rome 39, no. 2, pp. 155-162. Mackie, p. 2. Mackie informs me that “appeaser” is “a very secondary etymology” that does not appear in the scholarly literature about Jason (personal communication, July 30, 2009). Graves, R. 1993. The Greek Myths.New York: Penguin, p. 602. Rose, H. J. 1955. Review of The Greek Myths by Robert Graves. The Classical Review 5, no. 2, p. 208. Macpherson, J. 1958. Review of The Greek Myths by Robert Graves. Phoenix 21, no. 1, p. 17. Turner, P. and Coulter, C. R. 2001. Dictionary of Ancient Deities. New York: Oxford University Press, p.59. Cf. the frequent ancient practice of using a round number like 1,000 or 10,000 as a synonym for an uncountable number (as we do with “zillions”), or the frequent appearance of triads and trinities in myth. Some numbers apparently are more poetic than others and need not refer to alien sky science. Temple includes these authors in his bibliography, but while his endnotes cite passages from Hesiod and Pindar, these are not passages related to the Argonauts, a striking omission given the admitted centrality of the Argonaut story to The Sirius Mystery. I was unable to find a single direct citation of Apollonius (or Hesiod’s or Pindar’s Jason tales) unmediated through Graves. Apollonius of Rhodes. 1998. Jason and the Golden Fleece, trans. Richard Hunter. New York: Oxford University Press, p. 88. "Golden Fleeced" first appeared in eSkeptic in May 2010. © 2010 Jason Colavito. All rights reserved. Reproduction of this article is strictly forbidden without the express written permission of the author and eSkeptic.